Full colour Booklet Printing from Stationery Direct. 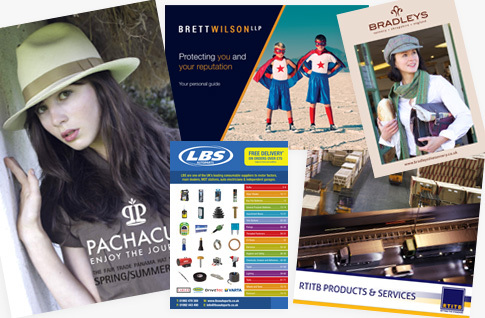 Our range of affordable Booklets are perfect for demonstrating what your business offers in a professional and easy-to-read format. They are litho printed, allowing for photographic reproduction of a superior quality. We offer high quality 170gsm Silk or Gloss paper, with a choice of Landscape or Portrait orientation at no extra cost. Finished with saddle stitch binding (stapled) for increased durability. Each folded page equates to 4 printed pages, therefore you can only order Booklets in multiples of 4 printed pages; starting at 8. If you require more pages than those shown on our website, please get in touch for a quote. What is the difference between Saddle Stitch & Perfect Binding? Is where the multi-page document is folded and bound by 2 staples along the spine and is ideally suited to a lower page count. Is where the printed pages and cover are glued together with a strong, flexible thermal glue to leave a flat spine. This method is typically used for thick documents with a high page count. Prices shown on this page are for Saddle Stitch only; if you require Perfect Binding please contact us for a quote. · Do you require a thicker cover or laminated outer? · Do you need more pages or Perfect Binding? · Need a bespoke size or specification?